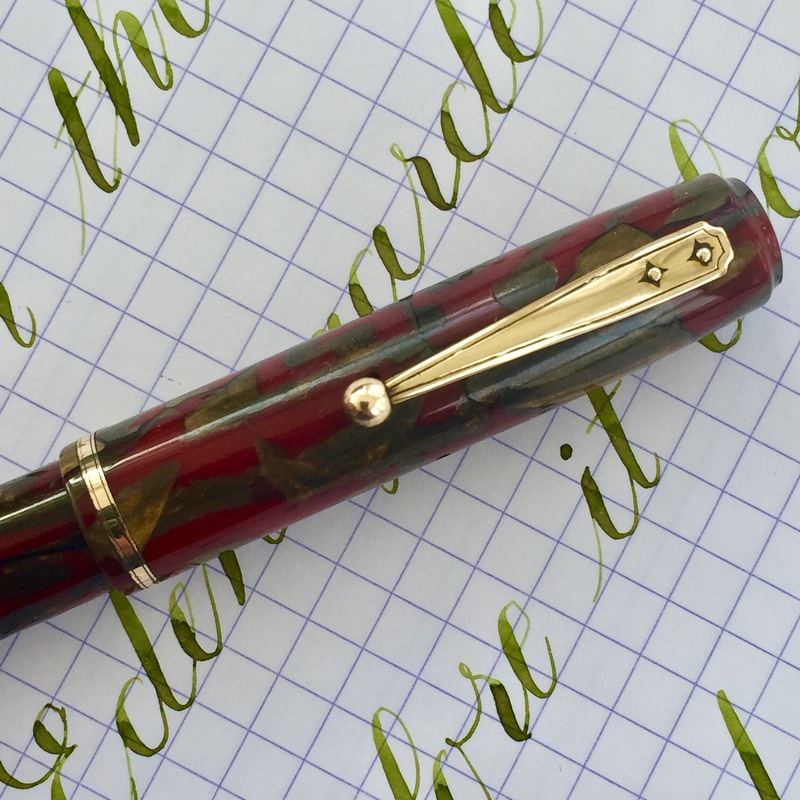 Here is a stunning Waterman 92 in red and bronze celluloid. 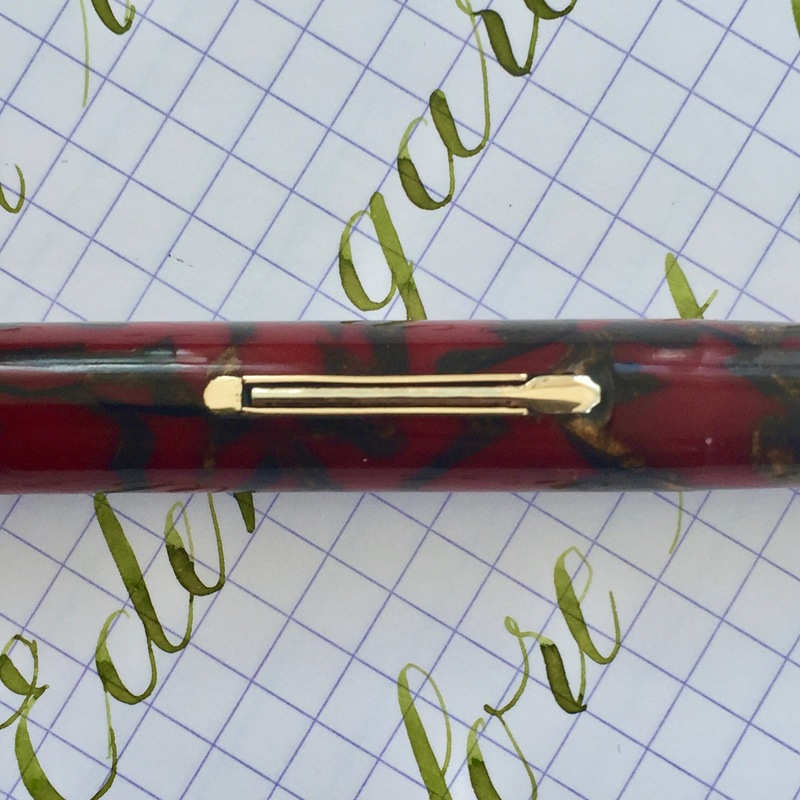 The pen is in great condition with beautiful color and minimal signs of use. The imprints are all pretty good and crisp except there is some wear on the imprint on the side of the barrel. Part of the “Made in Canada” is very faint. The gold-filled trim is also in great condition with only a tiny bit of plate loss on the head of the lever. The clip and band look very nice. 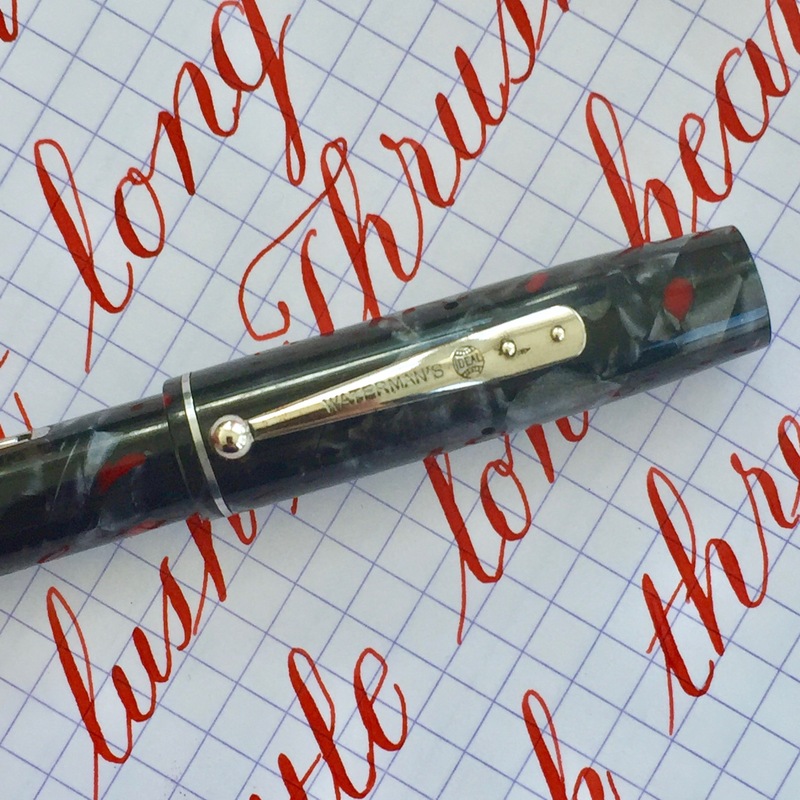 The real stunner of this pen, though, is that nib. The 14kt. 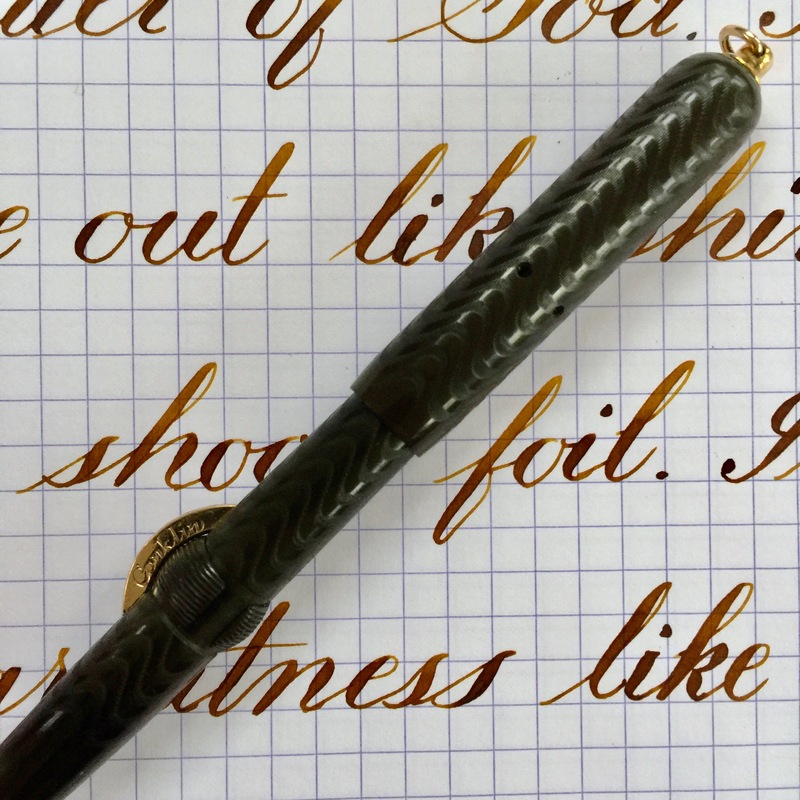 Waterman #2 is a nib of any artists or calligraphers dream. It’s an XXF wet noodle with paintbrush ease of flex unbelievably combined with a superb, bouncy responsiveness. 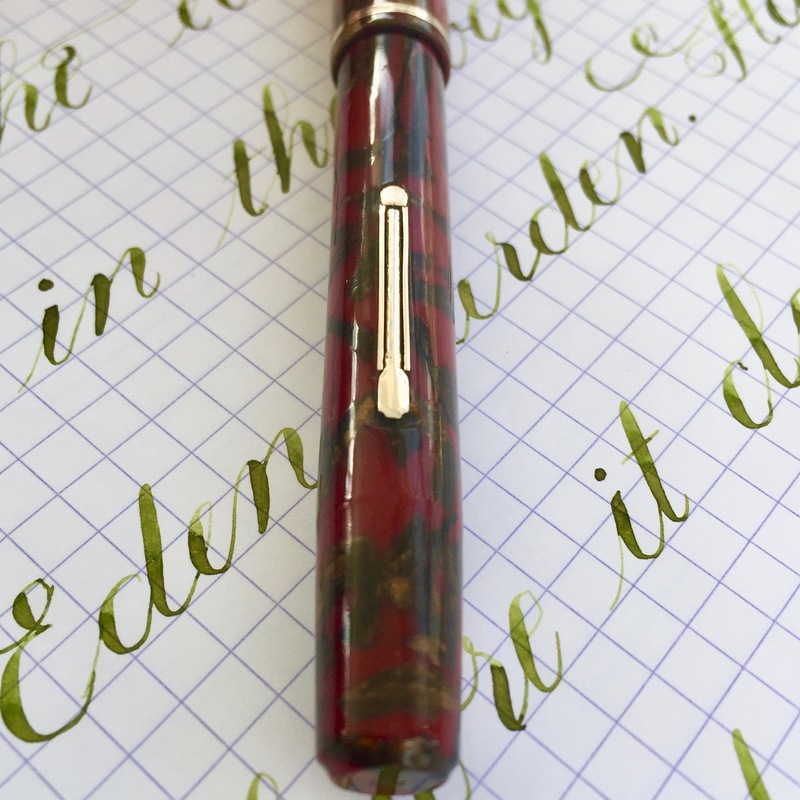 This is about as close to a dip nib as you can get in a fountain pen. 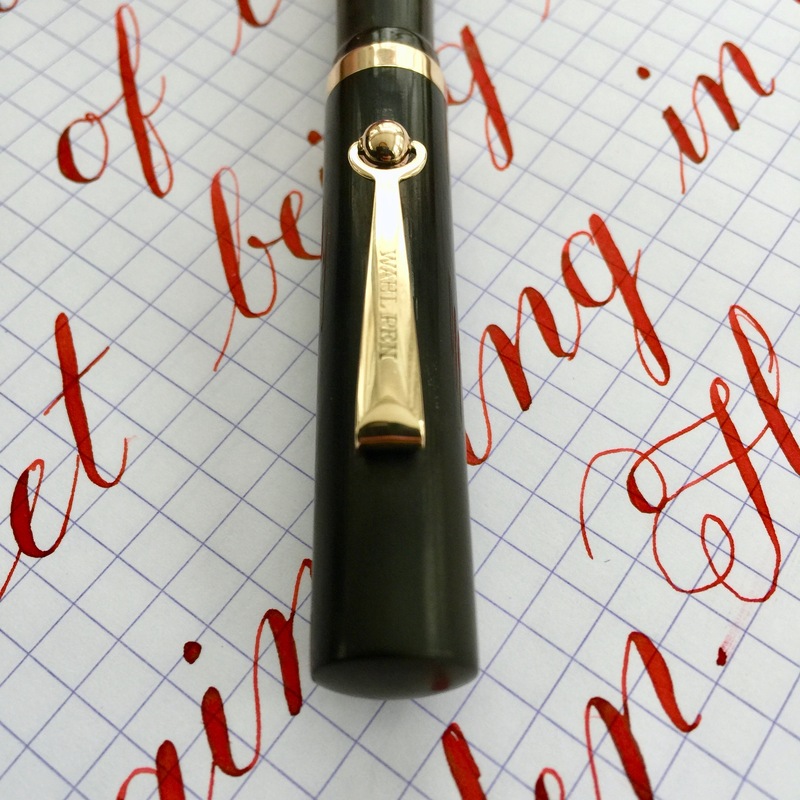 The XXF doesn’t make it great for normal writing. It’s too fine and soft, too easy to make the tines start spreading with slight pressure. But the flex!! 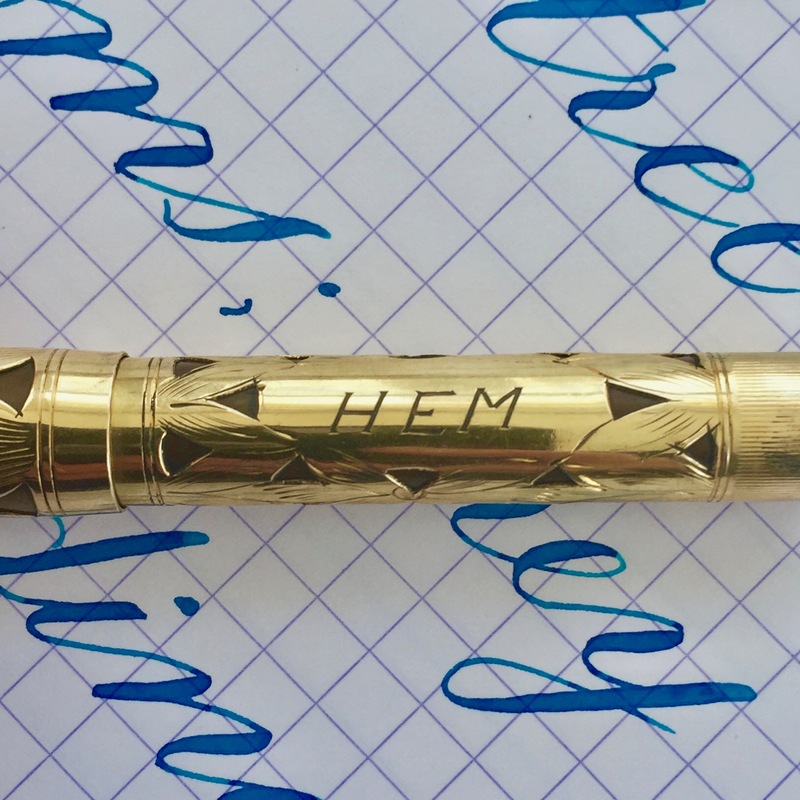 This isn’t for the big gushing brush calligraphy lettering, but rather for the detailed, precise lettering of something like Copperplate. An incredible wet noodle that likely won’t last long. 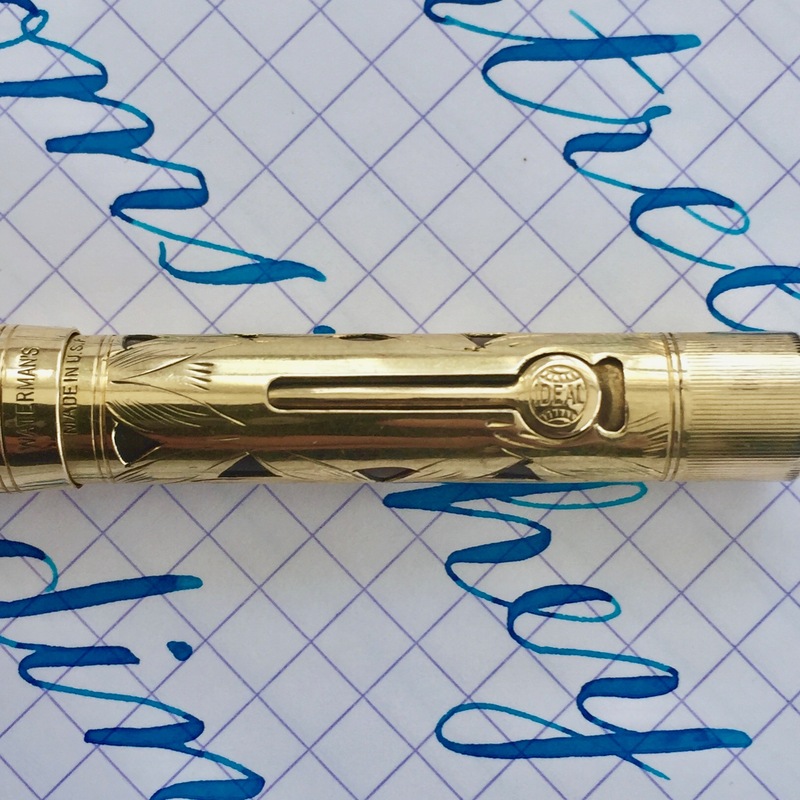 The Waterman 3V is very similar in size to the Waterman 52Vs. These came a bit later than the 52s and thus have bodies made of beautiful celluloid so rather than the more difficult to preserve hard rubber. But they still have hard rubber in all the places that matter (the section and feed). 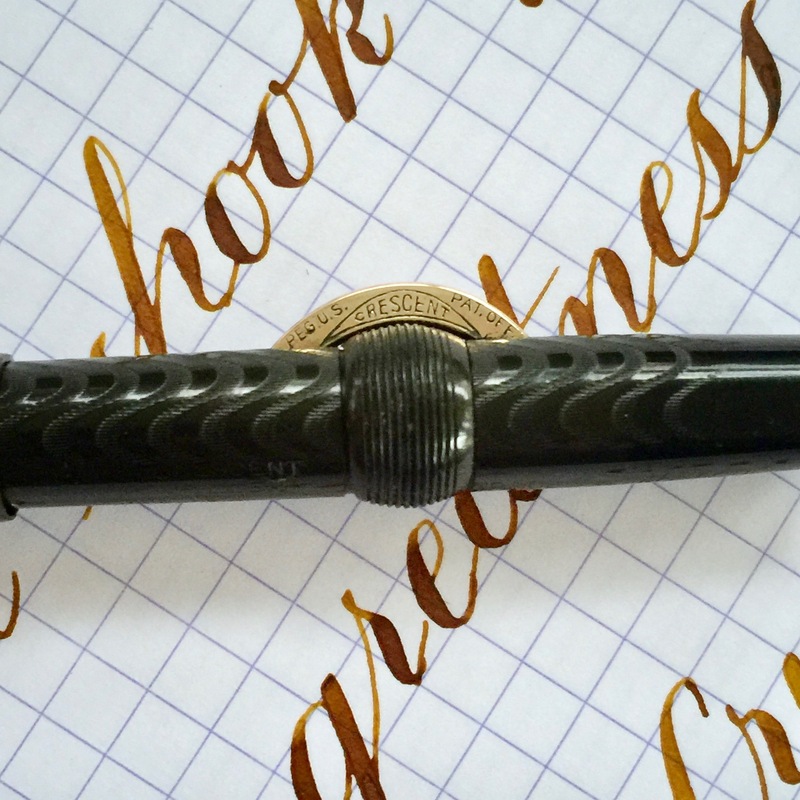 This pen’s body is black with marbled pearl and grey flecks. It’s quite stunning in person. There is very little wear on this pen, very few signs of use. The chrome plated trim is in great condition with only some very tiny blemishes on head of the lever and the bottom of the climb. But you can only see them if you look very closely. The body is sleek and shiny as new with all the flecks popping out. The 14kt. 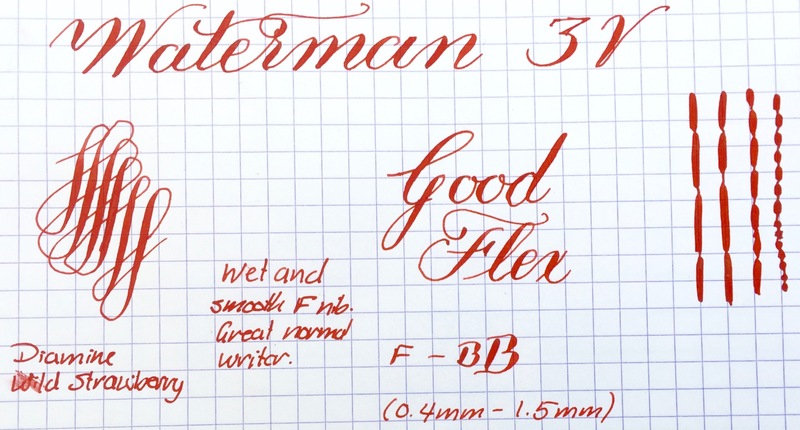 Waterman #2 nib is a buttery smooth writing F. It also flexes up to BB (1.5mm). 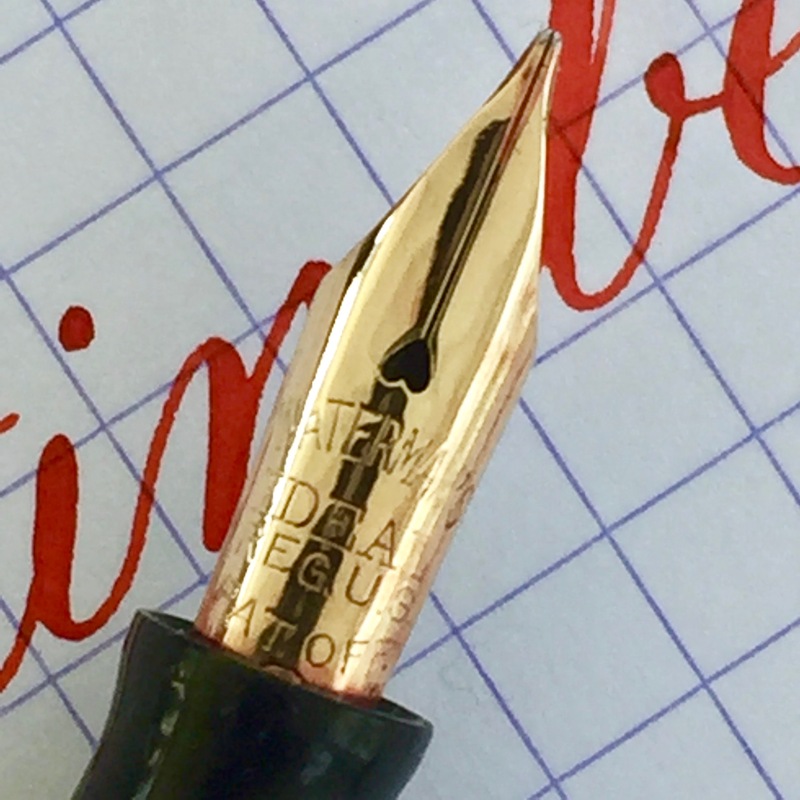 The flex is a bit too stiff to be in the super flex category, but this nib is still superior to pretty all modern flex nibs. 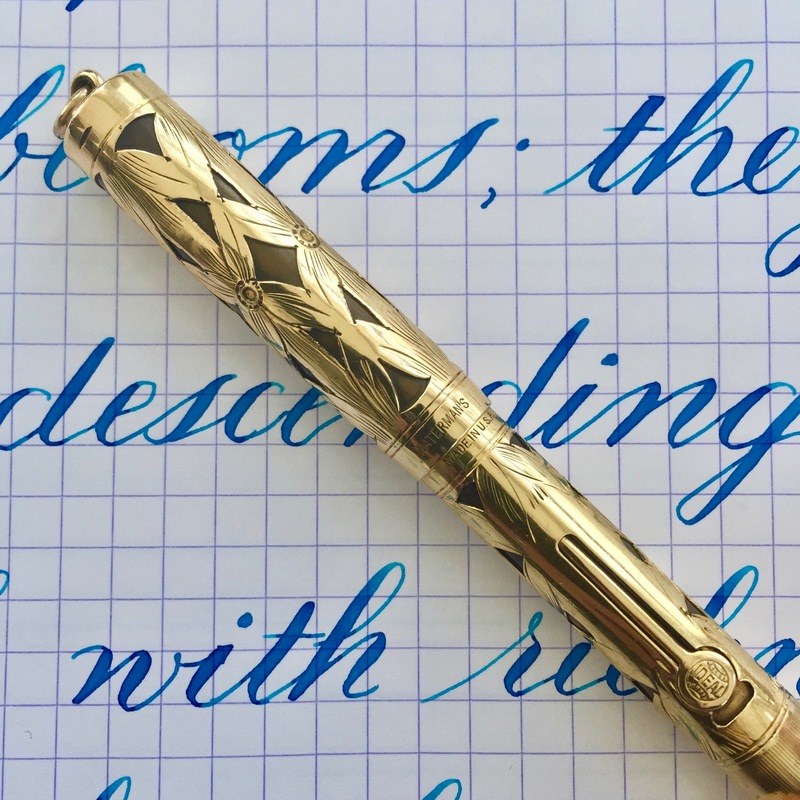 A gorgeous, quality vintage Waterman. 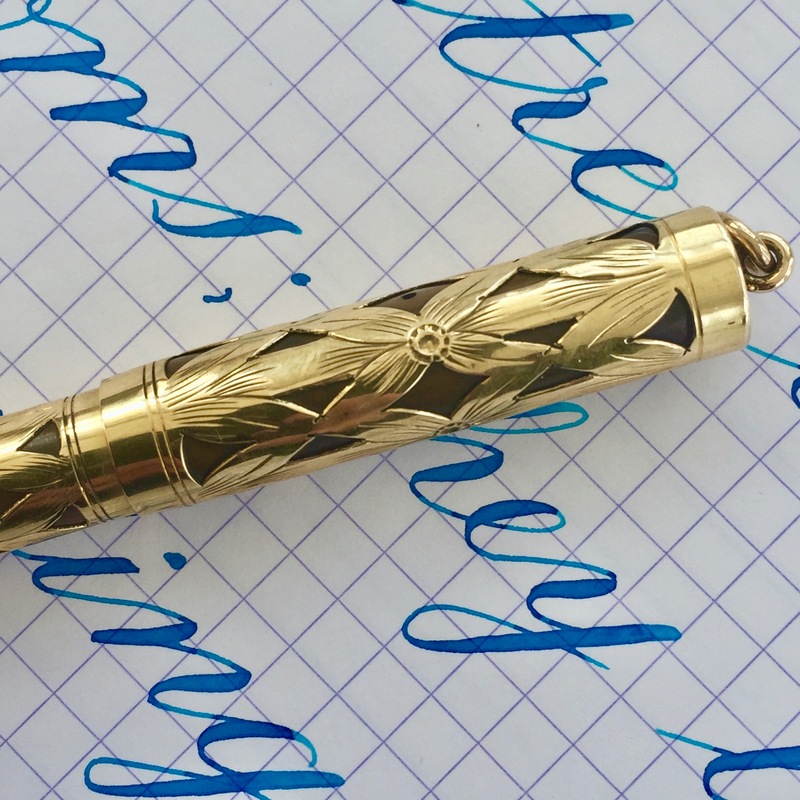 Here is a beautiful Waterman 0552 1/2 V in the golds-filled basket weave filigree. 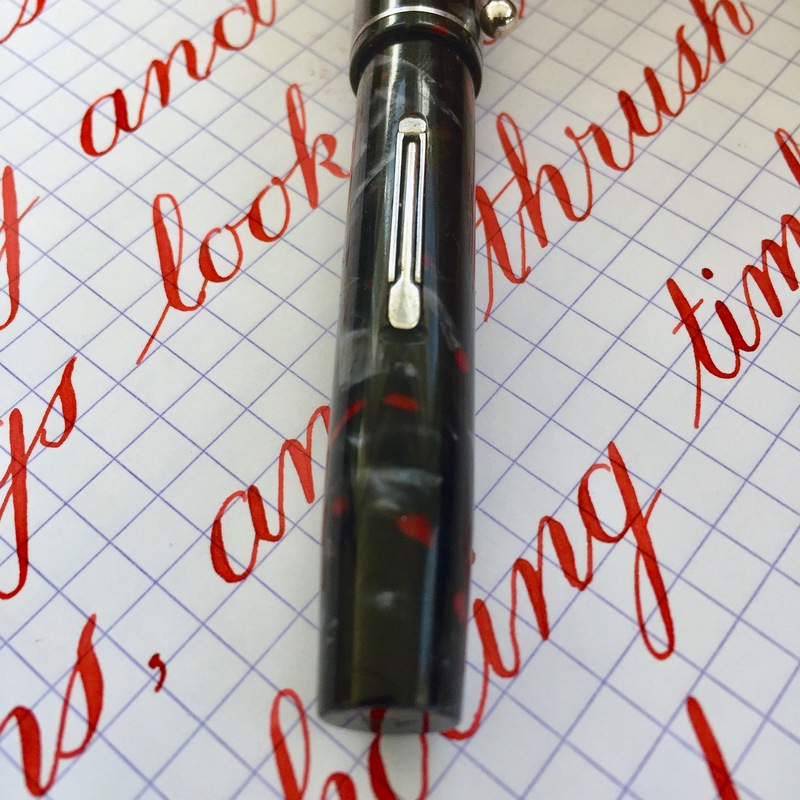 The pen is in very nice condition. The black hard rubber underneath the overlay, or the very little that you can see of it, has faded some to a dark brown. What’s inside the cap (bottom part of the barrel and section) are still very black. The overlay itself is in very nice condition minimal wear throughout. The end of the barrel does have wear do to posting the cap, but there are none of the usual dings. The gold-filled lever is in pristine condition as is the ring top. 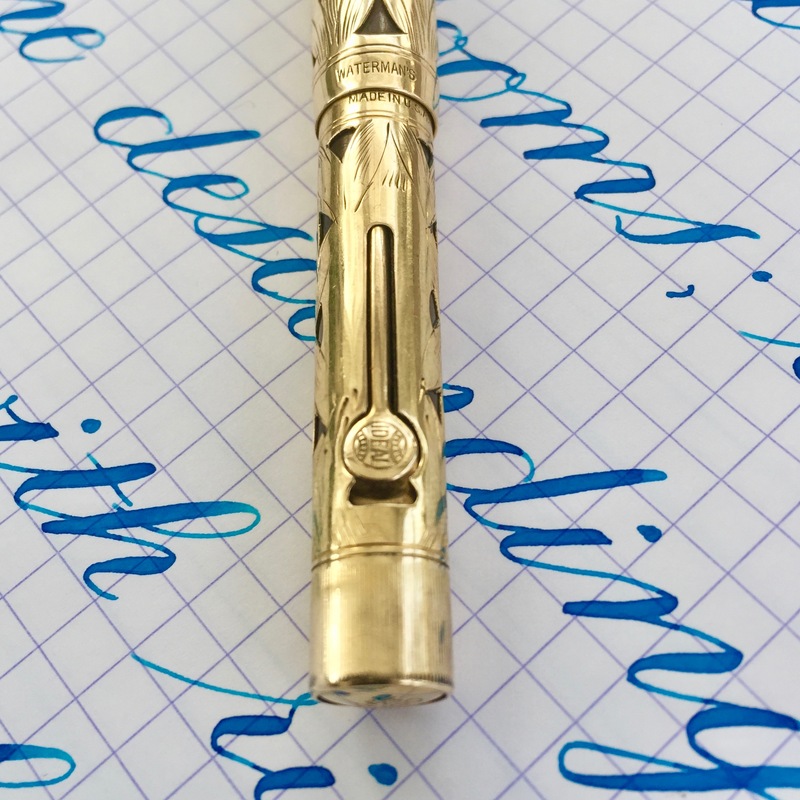 I don’t see any brassing on the pen. The 14kt. 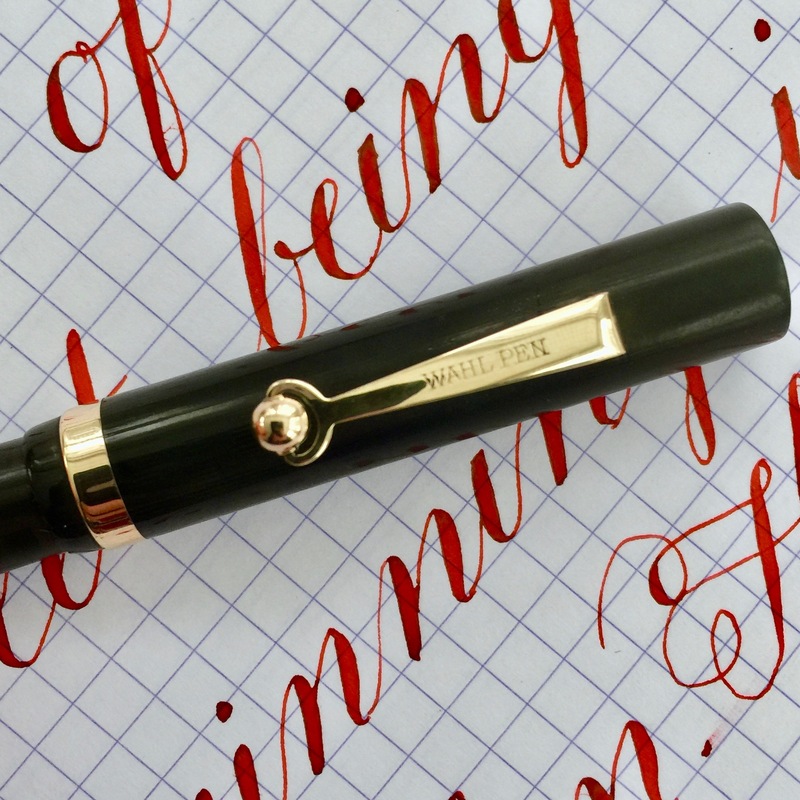 Waterman #2 nib is a very nice XF. 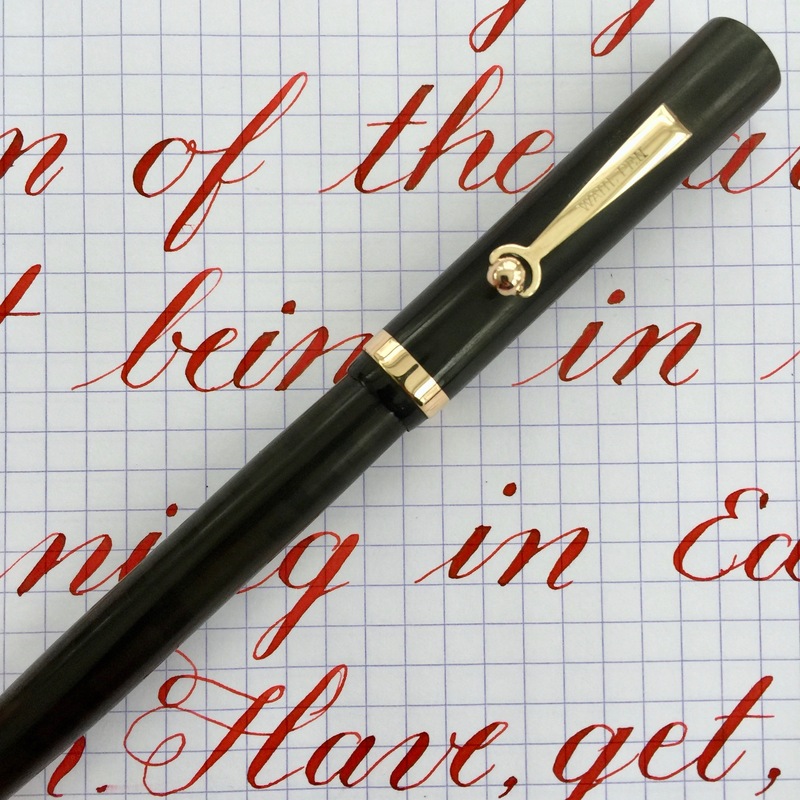 It writes with a good flow and is soft and beautifully smooth. 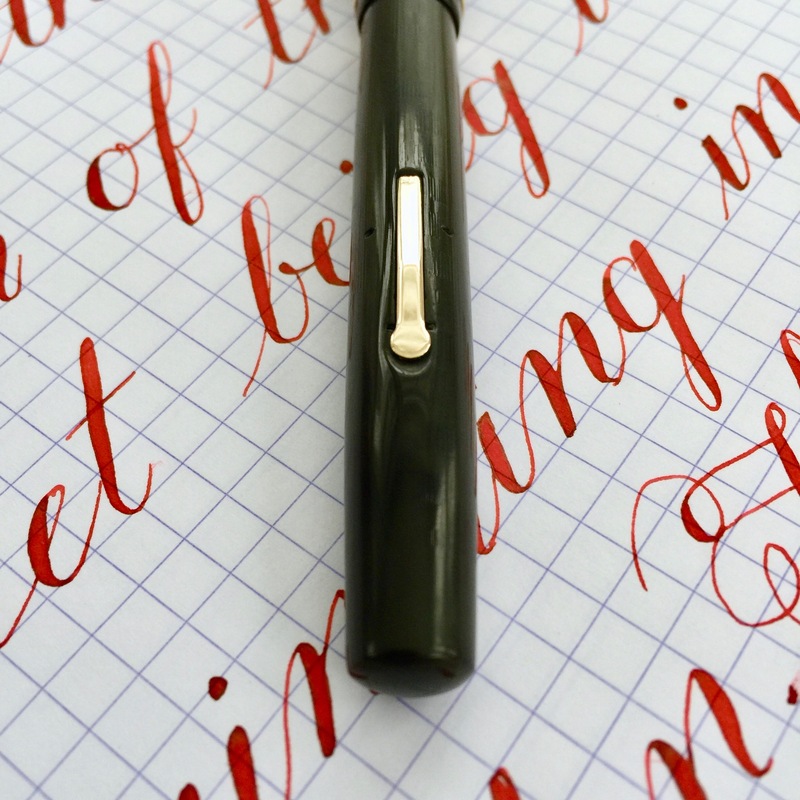 The flex on this nib goes from XF (0.3mm) all the way up to BB (1.6mm) with ease. 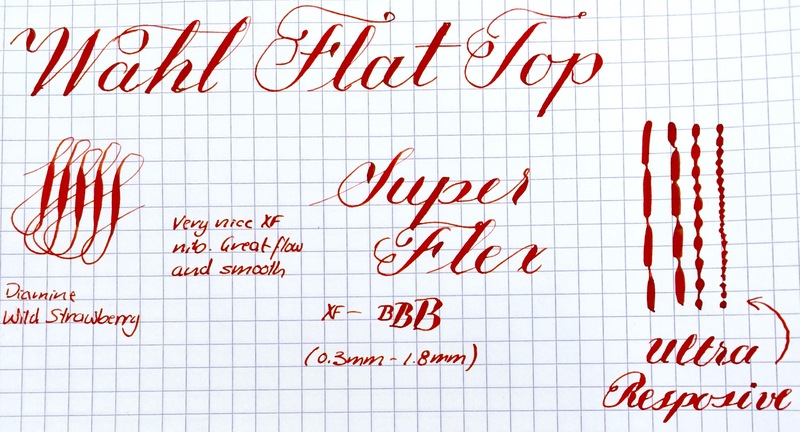 It also has that quality, bouncy responsiveness so desirable in vintage flex nibs. 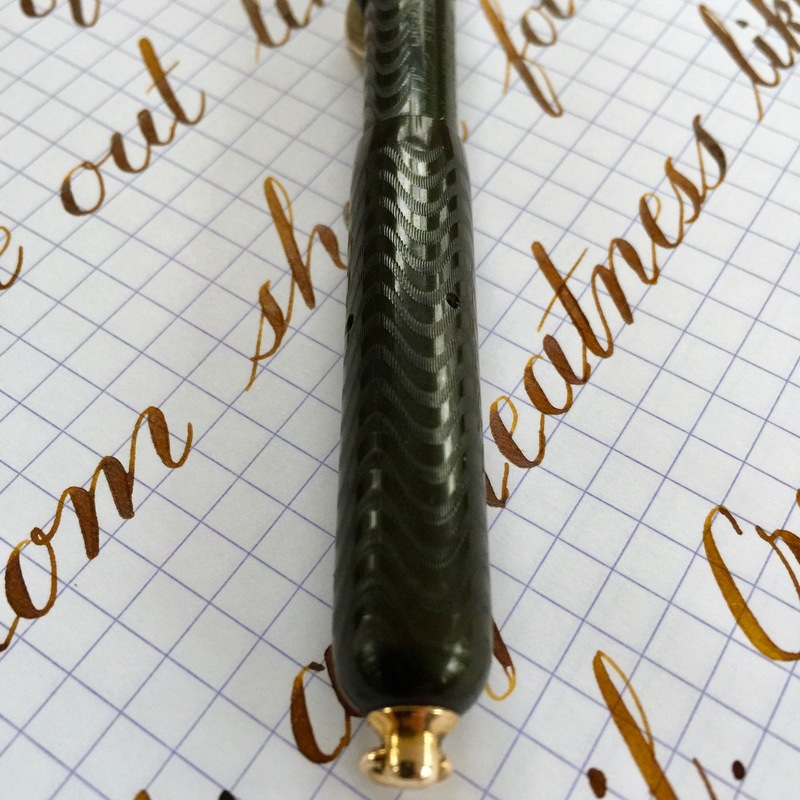 This is a sturdy, portable luxury item and conversation piece that is also a fine instrument for daily writing and flex art. 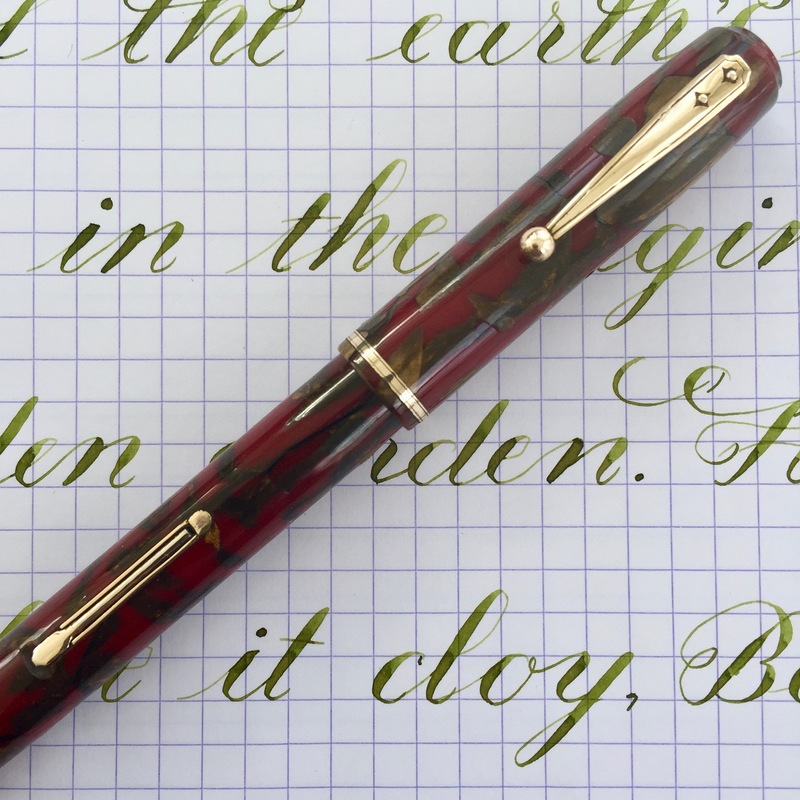 Here is a gorgeous Conklin Crescent in superb condition. 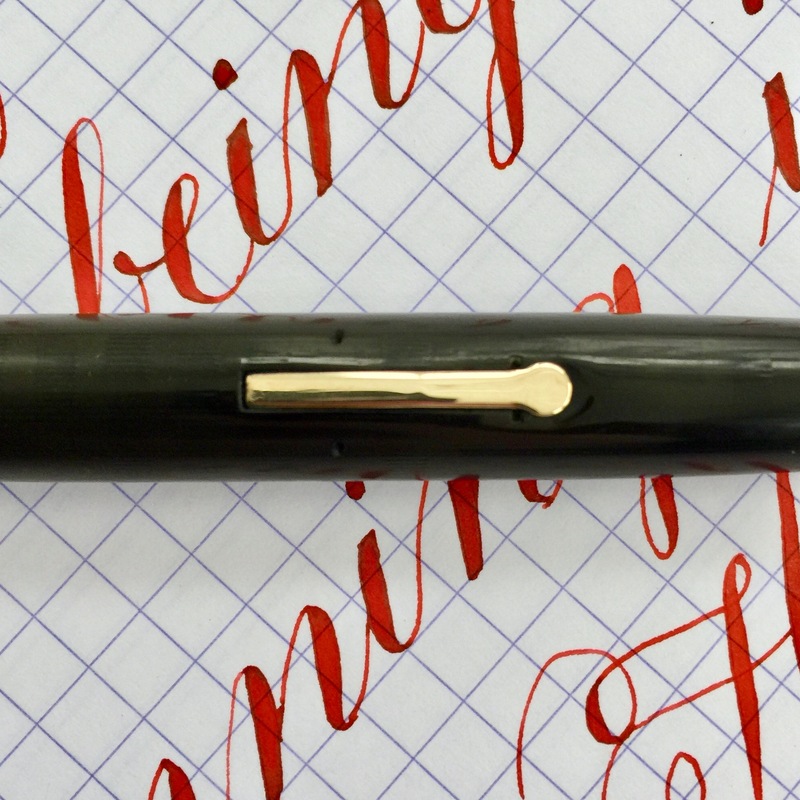 Really the only flaw in this pen is that the black hard rubber has faded slightly to browish black. Most would still call this black at first site. The chasing and imprints on the pen are perfect. Crisp as the day it was made. Latest patent date is Dec 1903. The trim is likewise perfect with no brassing and no scratching. The pen literally looks like it was put in a case and kept there without ever being used. 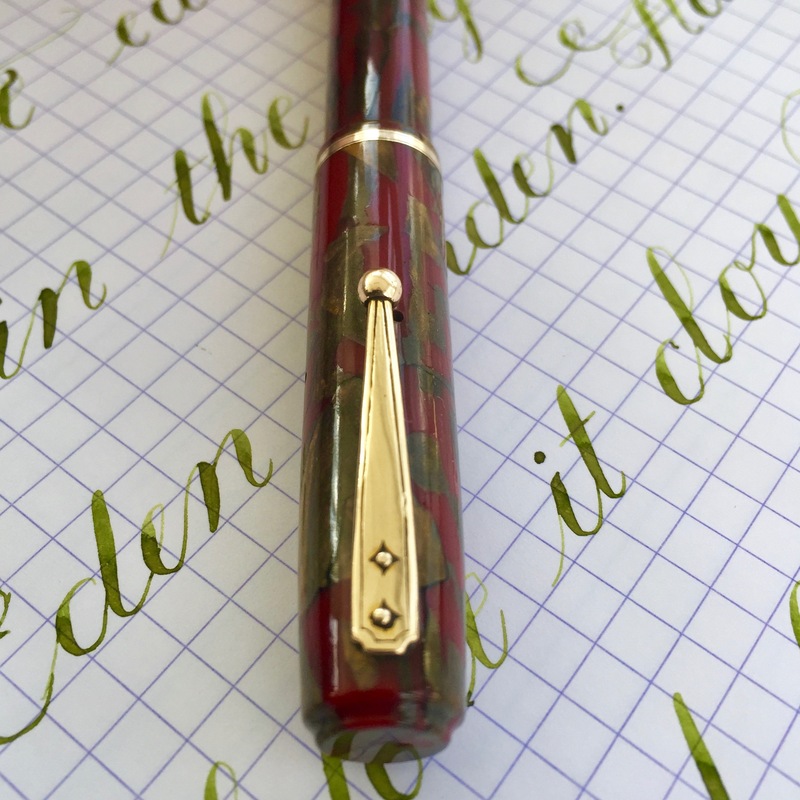 To top it all off, this Crescent has a beautiful 14kt. 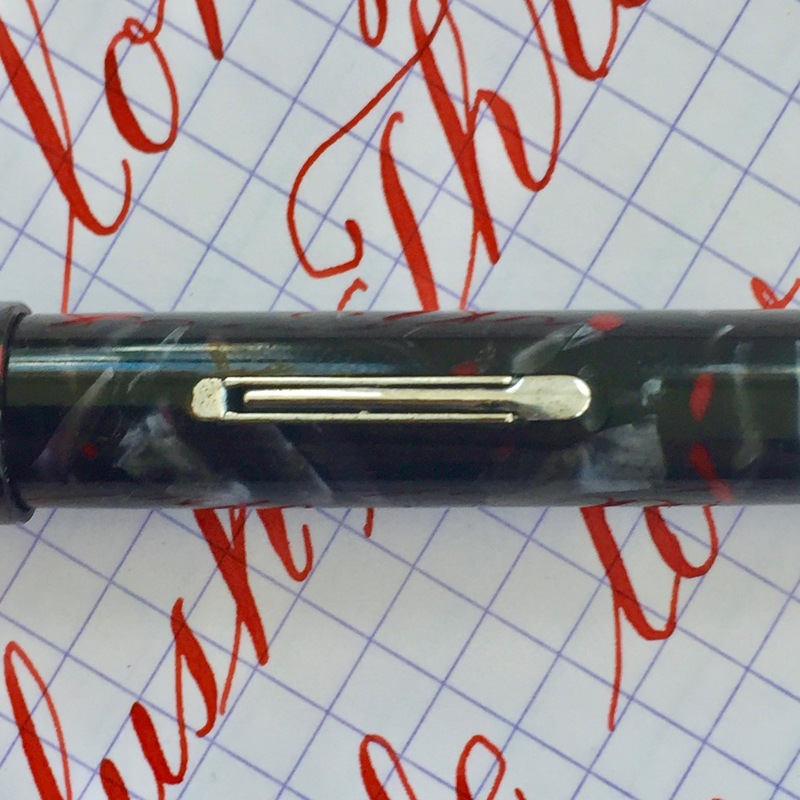 Conklin #2 nib. 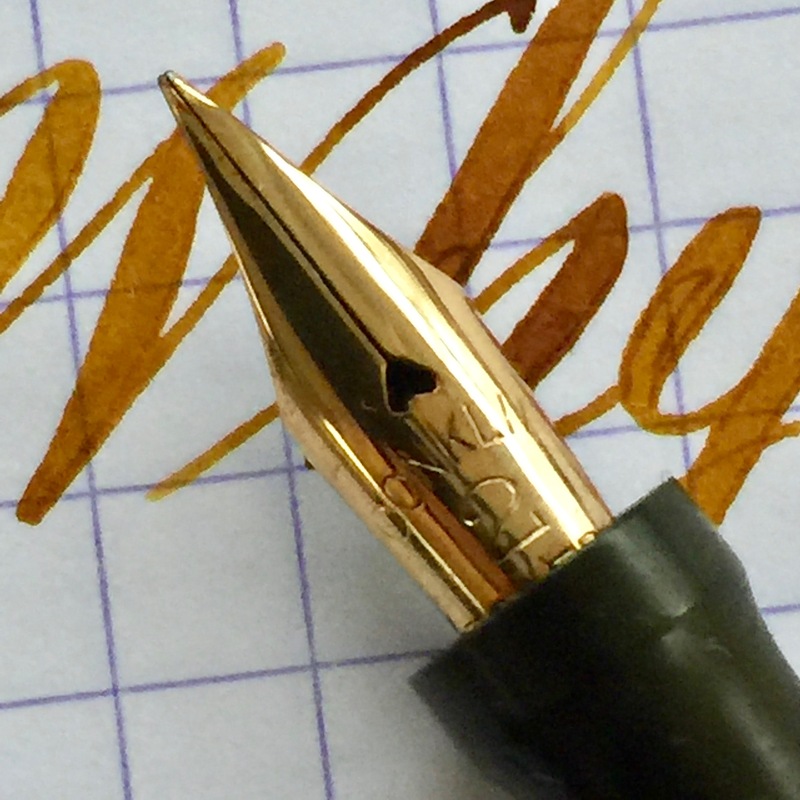 The nib writes normally as a soft F (0.4mm) with great flow. 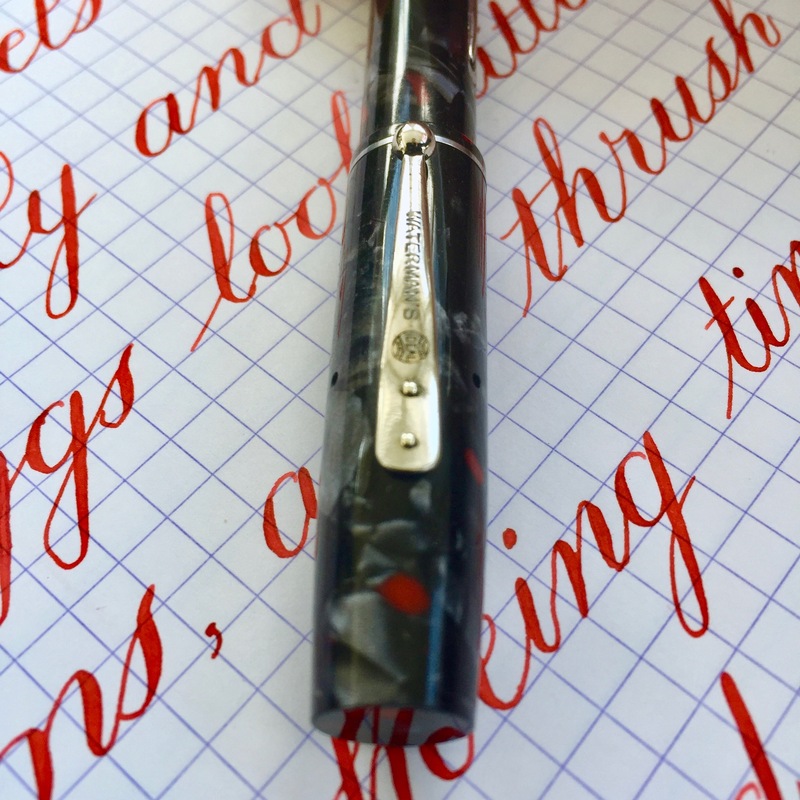 Flex on this nib comes very easily. 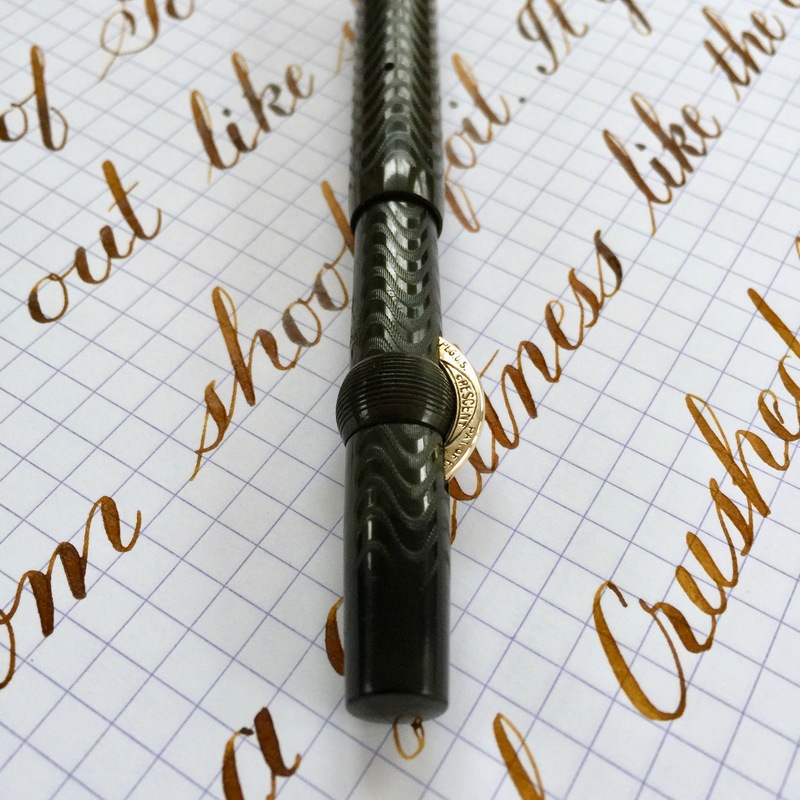 So easily, in fact, I would call this a borderline “wet noodle.” It ranges up to BBB+ (1.8mm), and has very good responsiveness. 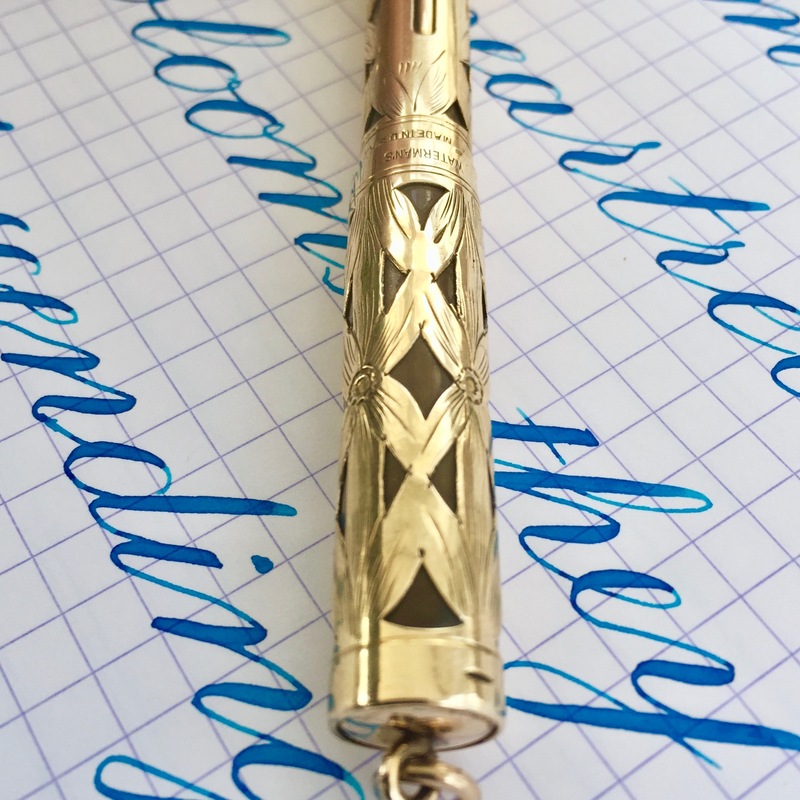 It’s just a phenomenal and collectible 100 plus year vintage flex pen. This is a 100 year old Wahl Flat Top in black hard rubber. The black hard rubber has faded to a dark, blackish brown. The Greco style chasing on the body has faded but is still visible. Just a little bit of texture left to it. The pinstripe chasing on the cap (which was originally pretty faint anyway, is almost all gone). The gold filled trim is in excellent condition with no brassing at all. This pen was definitely well cared for. 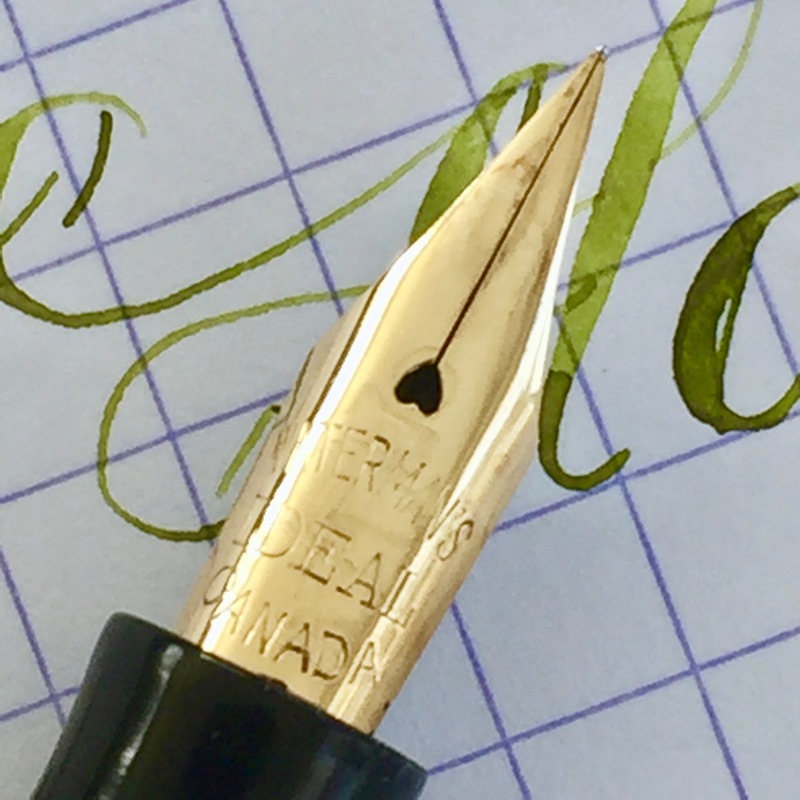 This Wahl also has a gem of nib. The 14kt. 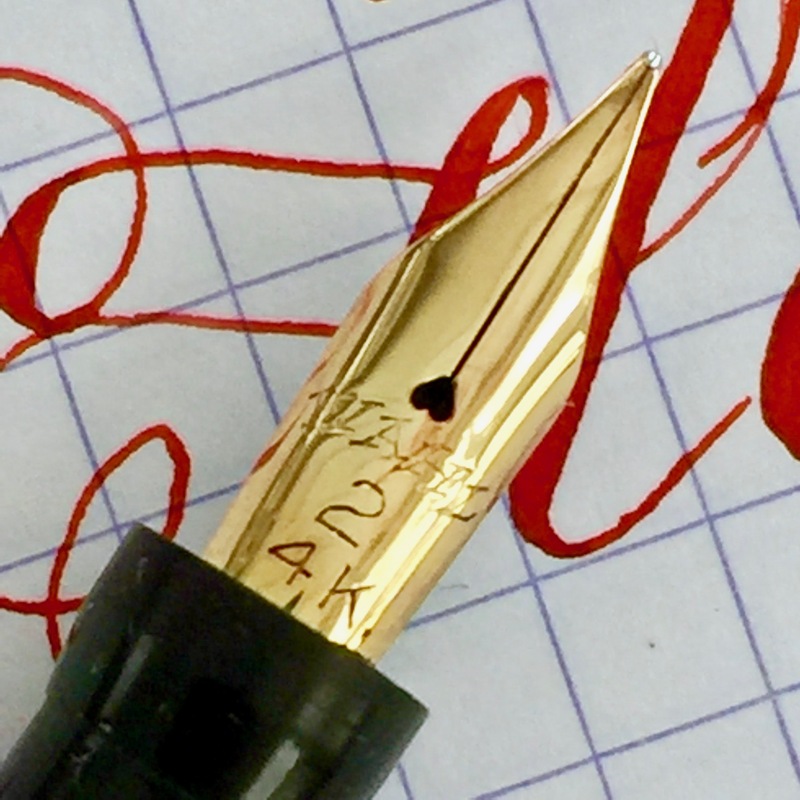 Wahl #2 is a very lovely XF (0.3mm) with great flow. Writes quite smooth for an XF. Flex is fantastic with a huge range going up to BBB+ (1.8mm). The responsiveness is very, very snappy. 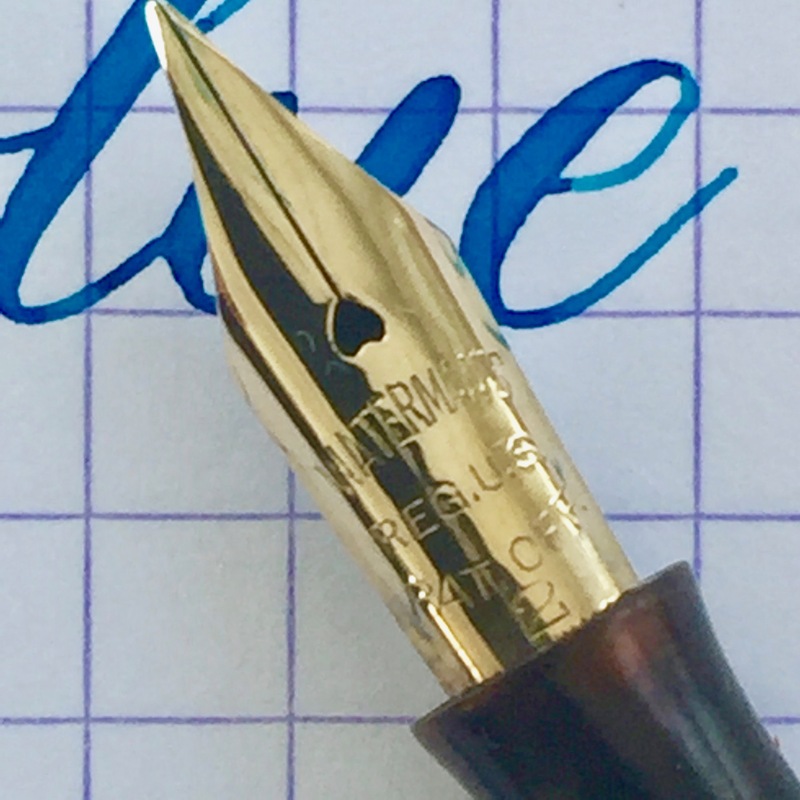 I almost rated this a “wet noodle” due to the quality of the responsive nib, but I couldn’t quite go there because it is just a bit too firm. 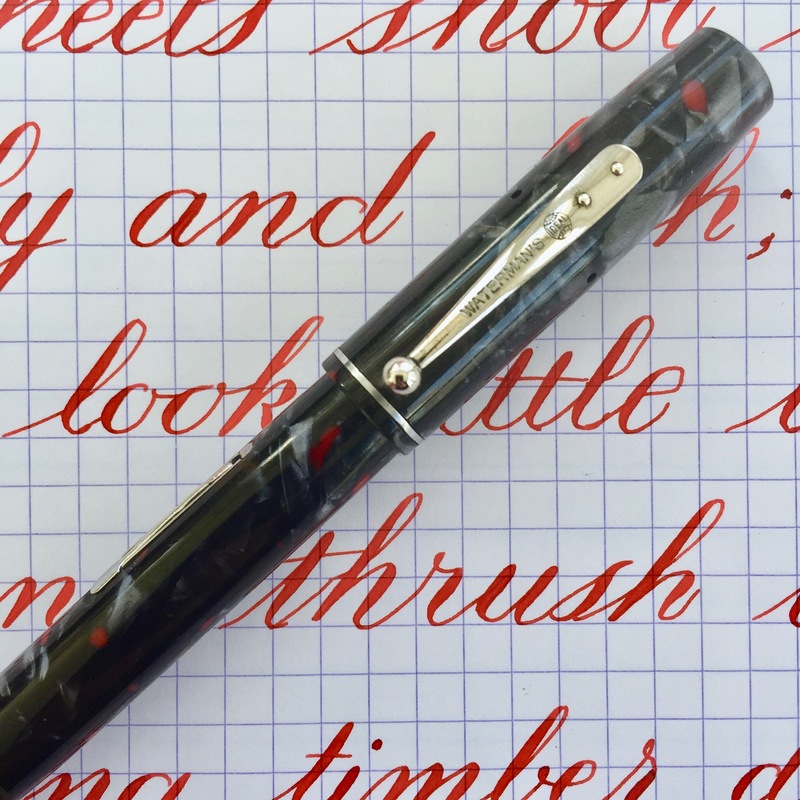 Still almost anyone would call this a “super flex” or “full flex” pen.